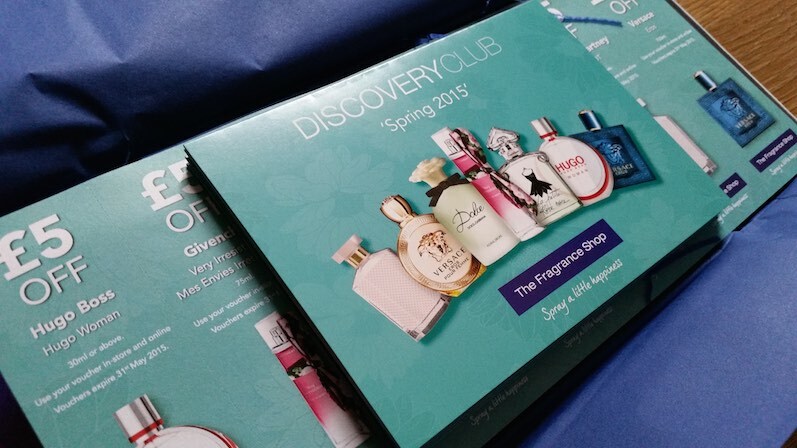 The Discovery Club by The Fragrance Shop is a UK based beauty box that is usually made up of five-six perfume samples and one or two aftershave samples (this can vary from box to box). 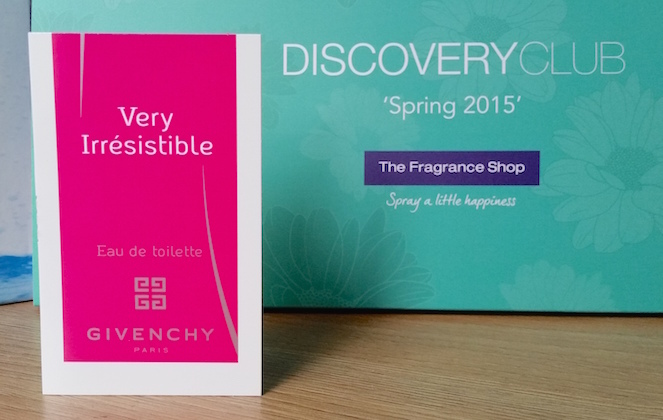 The first box of 2015 is the Spring fragrance box and it comes along with a brand new box design. The box is longer and more streamlined than the older boxes and it comes with illustrations on it too. This Discovery Club box contains a collection of six new female fragrance releases and one mens. 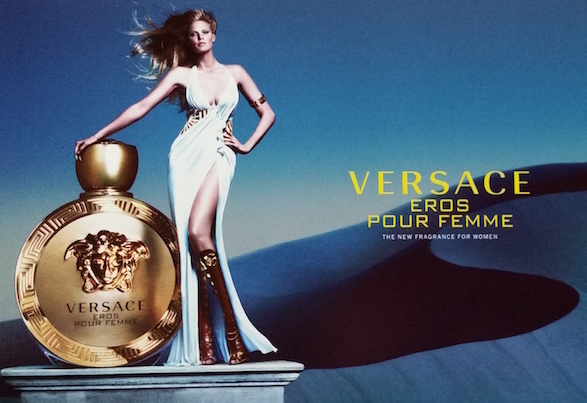 Versace’s Eros Pour Femme is a Greek inspired fragrance, designed to represent the God of love, Eros. 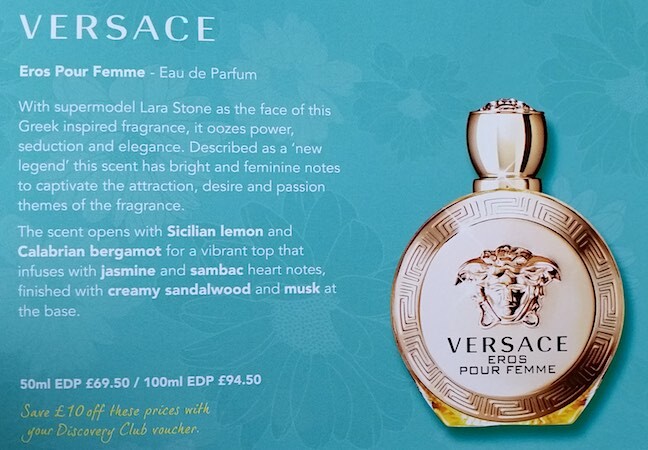 Opening with a fruity blend of Sicilian lemon, pomegranate and Calabrian bergamot, Eros Pour Femme is followed by a heart of jasmine sambac, lemon blossom and peony and rounded out with a base of ambroxan, wood notes, sandalwood and musk. To my nose, pomegranate is the most noticeable note of Eros Pour Femme. At the beginning this is teamed with a strong citrus kick of the lemon, but over time the overall scent becomes more floral-citrus with the jasmine taking a lead role, too. The longevity was pretty great. I was still able to smell a lingering Eros the next morning upon awakening, granted that I did have to put my nose right up to my arm to do so. At its peak, I was able to smell Eros from roughly an arms width away (and my boyfriend could smell it from sitting close by), so the sillage is pretty average. I can see this fragrance being quite popular. It’s a nice perfume that will appeal to a lot of people. It’s blended well, is easy to wear and it’s zingy, which is great for the upcoming warmer months. However, it isn’t particularly unique. I can’t see this being an issue to many though, so don’t let this put you off giving it a whirl. 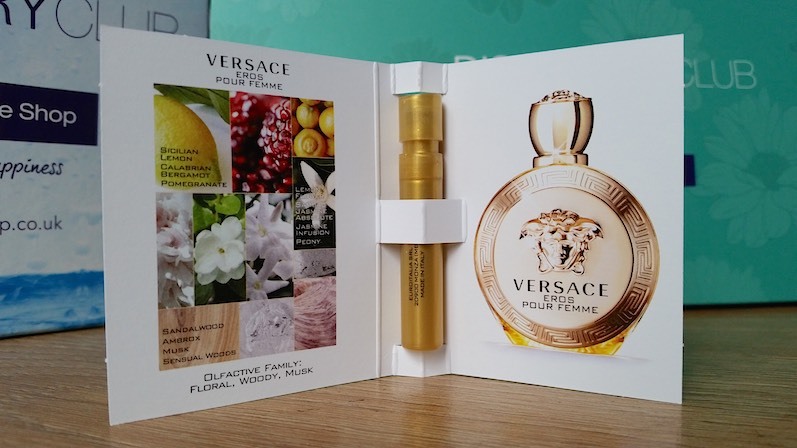 If you are the type who enjoys the zesty, fruity-floral type of scent, you may like this one! 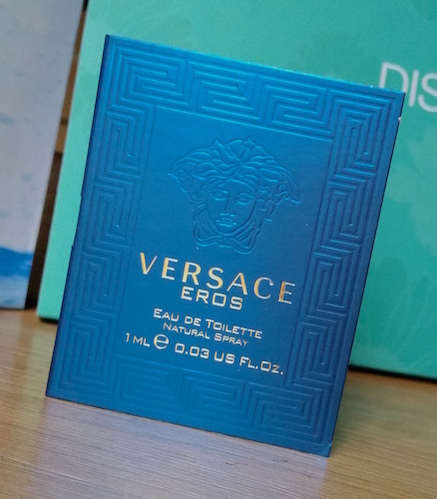 You can purchase Versace Eros Pour Femme for £49.50/30ml, £69.50/50ml or £94.50/100ml, all of which come with a free miniatures set from The Fragrance Shop. This Discovery Club box also comes with a £10 off voucher for Eros. 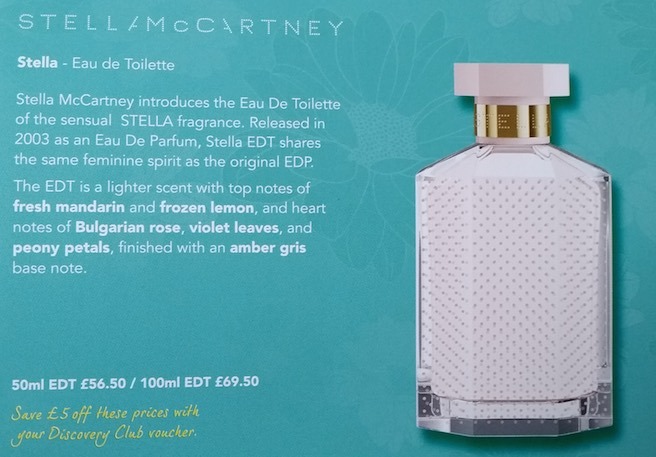 Stella McCartney has recently released the EDT version of her Stella perfume which was re-launched in 2014 with a new bottle and box design (although the juice itself didn't change). The EDT keeps the inspiration of the EDP, basing the fragrance around rose. The top notes consist of freesia, frozen lemon and mandarin, the heart is made up of Bulgarian rose, violet leaf and peony and the base note is amber. For me, the most noticeable note in Stella is definitely rose. From the very first spritz the rose is the most dominant element of the fragrance. In the beginning the rose is quite clean and crisp, which I would assume is thanks to the fruity top notes, but over time the other flowers in the composition become the roses backup. The lasting power of this fragrance is also fantastic, especially for an EDT. The next morning there is an ambery-floral type of scent left on the skin, but once again it does require some nose burying to discover it. 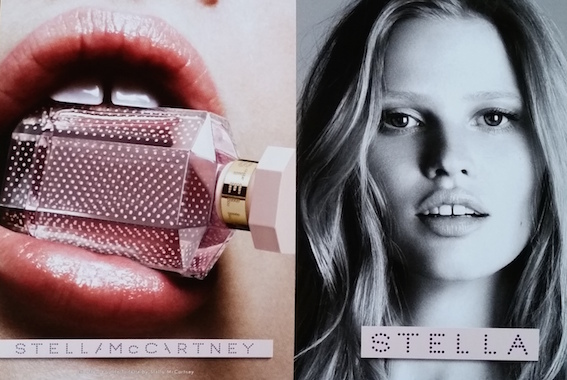 You can purchase Stella McCartney's Stella EDT for £41.50/30ml or £56.50/50ml (the latter of which comes with a free gold nail varnish) from The Fragrance Shop. Hugo Woman EDP is the latest release from Hugo Boss. 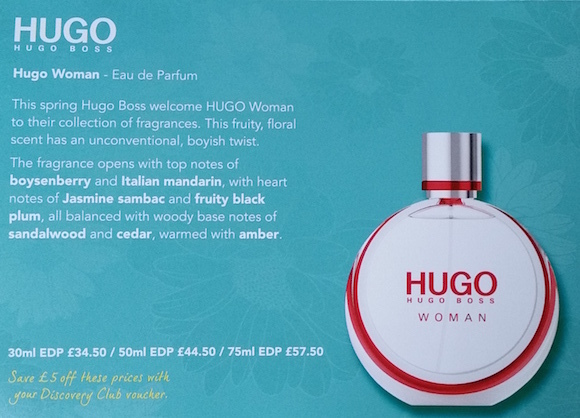 The original Hugo Woman was released in the nineties as an EDT, but 2015 now brings us the new EDP formula. 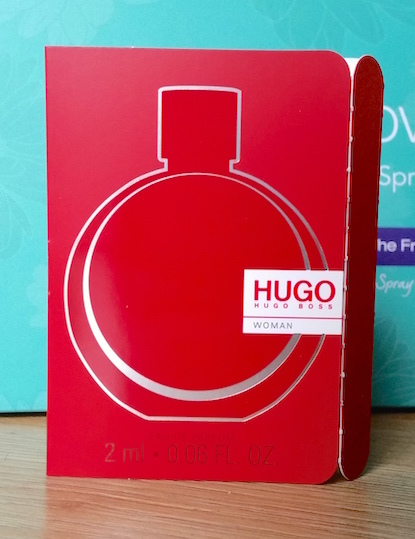 Described as being a blend of both feminine and masculine, Hugo Woman is a fruity-floral that contains both natural ingredients and "pioneering molecules" to create a fragrance to "reflect Hugo's minimalist glamour." Top notes include boysenberry, grass and Italian mandarin, the middle a combination of jasmine sambac, plum, iris and spicy black tea and the base a mix of cedar, sandalwood and amber. 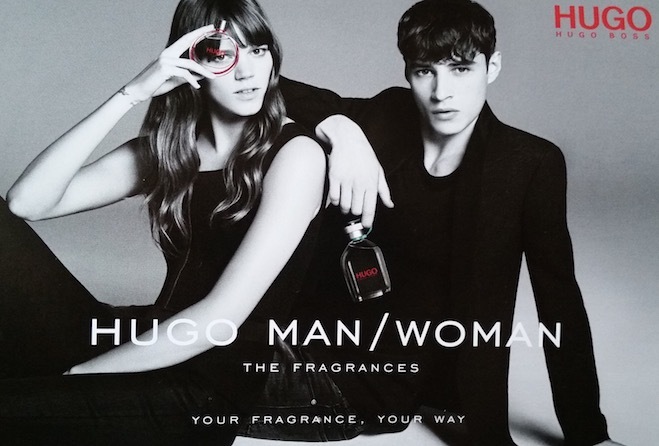 The overall vibe of Hugo Woman to me is youthfulness, so I can imagine it being popular with a primarily younger audience. The longevity of Hugo Woman is only a few hours, so it is the type of scent that will need top ups throughout the day if you want it to last. The sillage is also pretty average. You can purchase Hugo Boss Hugo Woman for £34.50/30ml or £57.50/75ml (the latter of which comes with a free Hugo Boss clutch bag) from The Fragrance Shop. 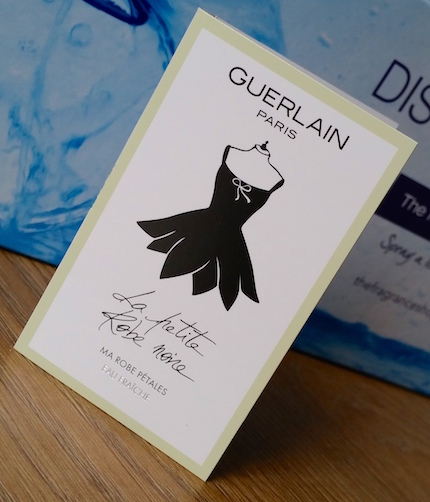 Guerlain’s Le Petite Robe Noire Eau Fraiche is the latest flanker of their Le Petite Robe Noire perfume. It comes as an EDT and is green in colour, differing from the pinks and purples of the rest of the line. The top notes are made up of citrus fruits, including Sicilian mandarin, lemon and bergamot whereas the heart is floral, containing Turkish rose absolute, Bulgarian rose, freesia, jasmine sambac and almond blossom. The base consists of musk, pistachio, tonka bean, almond and patchouli. Whilst personally I don’t usually get particularly over-enthusiastic about ‘fresh’ flankers of a fragrance, this is one that I do really enjoy. Even with the fresh and fruity notes, Le Petite Robe Noire Eau Fraiche seems more almond and floral to me with the underlying hint of fruit. It also has familiarity to it’s original, so it really does feel like a fresher, spring time version of Le Petite Robe Noire. For me, the longevity was pretty moderate and the sillage quite soft, which is just right for a 'fresh' type of scent in my opinion. If you like Elie Saab’s L’Eau Couture then there is a big chance that you will enjoy this. 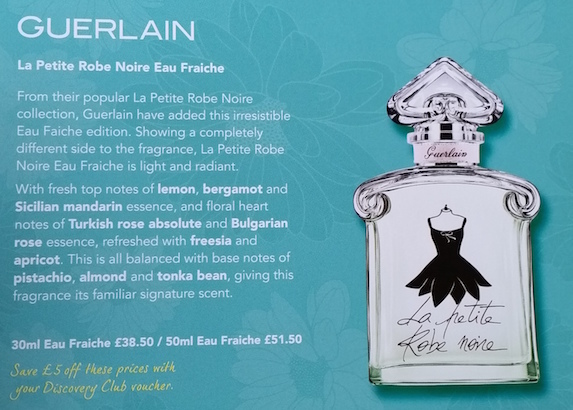 You can purchase Guerlain’s Le Petite Robe Noire Eau Fraiche for £38.50/30ml or £51.50/50ml, (both of which come with a free Try it First sample and the latter of which comes with a free Guerlain pouch) from The Fragrance Shop. Whilst Dolce & Gabbana may not be everybody’s favourite designers right now, we still have to discuss their new flanker release: Dolce Floral Drops. Described as being a “fresh and airy scent that depicts the scent of freshly picked flowers sprinkled with dew,” Dolce Floral Drops is another green coloured juice that is almost impossible to distinguish from it’s mother scent bottle-wise except for the frosted effect on the glass. The top notes include neroli and papaya flower, the heart a blend of water-lily, narcissus and amaryllis and the base a mix of musk, sandalwood and cashmere wood. 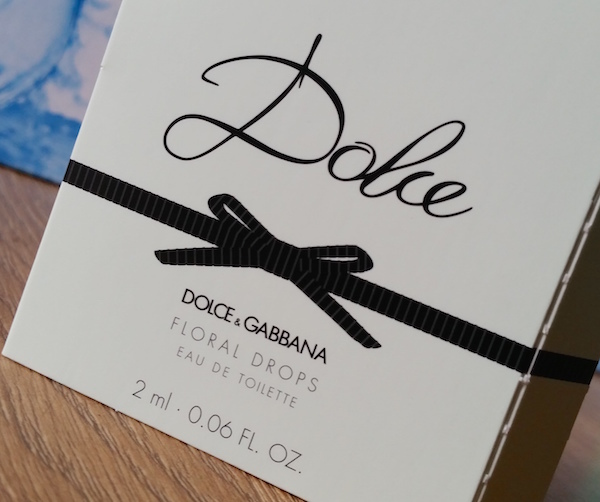 On first spray it seems to me that Dolce Floral Drops is not only indistinguishable from it’s predecessor in bottle design only, but scent wise too. There is a lot of bright and cheerful floral going on in the opening and it is easy to see why a lot of people would enjoy it. However, on me, the longevity of the pretty flowers faded pretty rapidly. After a couple of hours all I could smell was musk and pretty much nothing else. 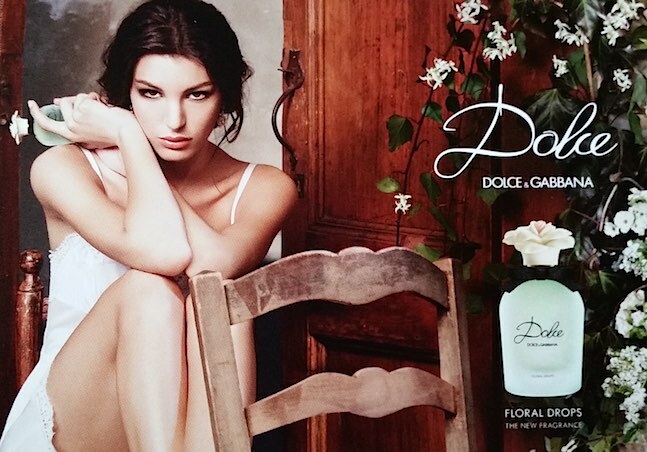 I don’t think that it is Dolce & Gabbana’s best fragrance release. They have far better ‘fresh’ perfumes under their name, such as Light Blue. With that said, I can still see this being popular, but maybe not quite as much so as the original, Dolce. Yet again, they smell and look incredibly similar, so maybe people won’t be able to tell which they’re buying!? 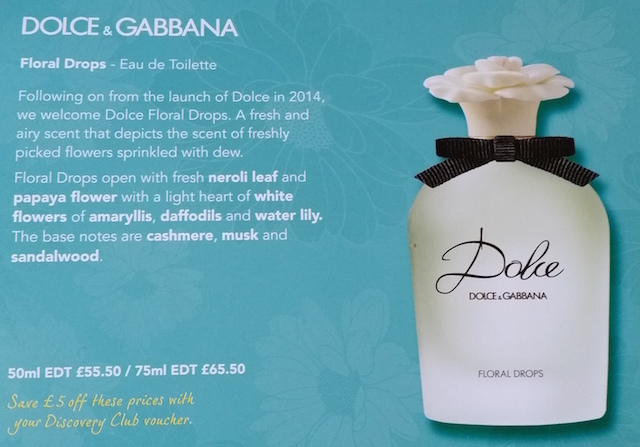 You can purchase Dolce & Gabbana Dolce Floral Drops EDT for £43.50/30ml, £55.50/50ml or £65.50/75ml (all of which come with a free Try it First sample, but the latter two also come with a free nail varnish) from The Fragrance Shop. Givenchy's Very Irresistible Mes Envies is a limited edition version of the Very Irresistible EDT. It is also based around rose, with a composition that includes five different types of rose in addition to star anise. Describing Very Irresistible Mes Envies is pretty simple. It is rose. Lots of rose. If you don't like rose or if you like your rose scents to be more balanced, you won't like this. However, if you love rose, you will likely love this. It isn't the longest lasting fragrance and the sillage is pretty soft, but I can imagine the pretty, reusable flowery bow that comes attached to the bottle attracting a fair amount of people. 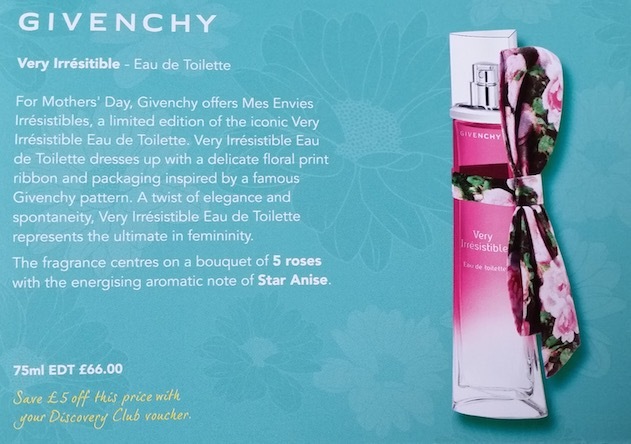 You can purchase Givenchy Very Irresistible Mes Envies for £66/75ml from The Fragrance Shop. 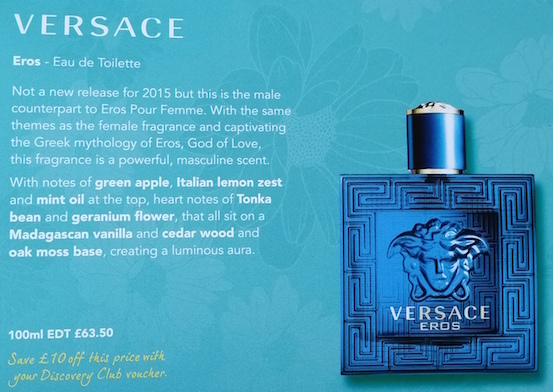 Versace's Eros is the lone male sample included in this Discovery Club box. Whilst not a new release (it was released in 2012), it has been included as the female counterpart was also a part of this box. Eros, like the female version, is based upon the Greek God Eros. The top notes include lemon, mint and apple, the heart a mix of geranium, ambroxan and tonka bean and the base a combination of oakmoss, vanilla, vetiver, Atlas cedar and Virginian cedar. From the first spray, Eros is incredibly clean, fruity and minty. It eventually settles down and the vanilla begins to come through. At one point I was hearing myself describe it out-loud as a 'minty-vanilla-apple' which at first sounds weird, but it was oddly pleasing. The sillage is pretty good, too. I could easily smell it on my boyfriend from across the room. The longevity is pretty long-lasting also, but my dad has complained about the longevity of Eros being really poor. To me though, I think that Eros is quite youthful and also quite summer-suitable. 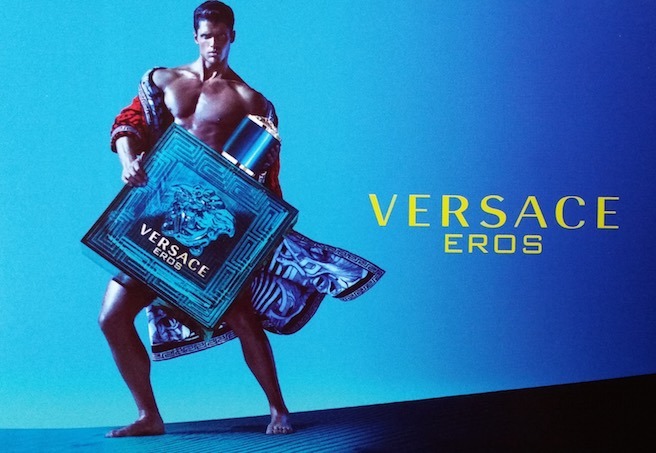 You can purchase a bottle of Versace Eros for £29/30ml gift set or £63.50/100ml from The Fragrance Shop. This Discovery Club box also comes with a £10 off voucher for Eros. Overall I think that the first Discovery Club box of the year is a pretty good one. It's full of clean and fresh springtime scents for you to get your nose around and a collection of money off vouchers that total £45 in savings. 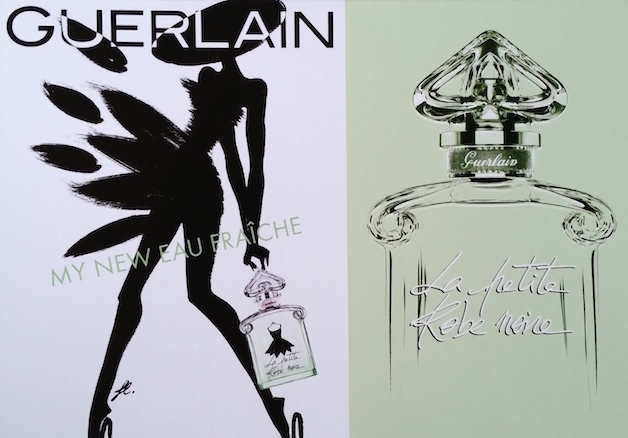 If I had to choose and recommend just one fragrance out of the Spring 2015 box, I would choose Guerlain's Le Petite Robe Noire Eau Fraiche. It's a beautiful scent that screams spring without being too fruity, floral or too similar to a hundred other spring releases. If you aren't yet subscribed to the Discovery Club then you can do so for just £5 a quarter, £10 for half a year or £20 for the entire year and you can cancel at any time. You can sign up here. What are your thoughts of the Spring 2015 Discovery Club box? Which scents in this box do you love or hate? All note information is from Fragrantica.